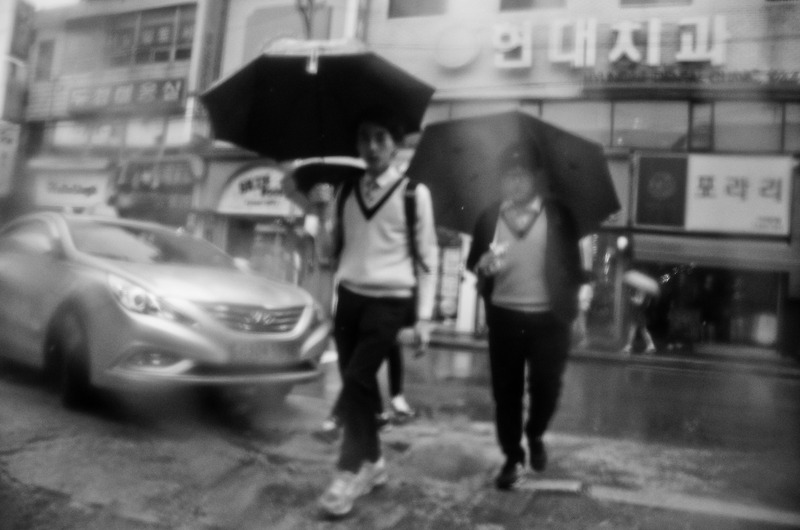 One more in the little series of shots taken (I don’t subscribe to having to say you make photographs – make, take schmake) in the rain with the shower cap over the lens when I was in Korea. This one was taken as a group of school kids approached me as I stood in a doorway sheltering from the rain. I cannot recall with accuracy if I was bending down to get the shot from below, but I think from the perspective of the guy in the white jumper I must have been. Life is hard for school kids in Korea. A typical day starts before dawn and ends about midnight. Yes! Midnight! It is surreal to go out for a late night drink and see groups of children in their school uniforms shuffling home after cramming school. Koreans are an industrious and obedient lot. Huge importance is placed on schooling and their belief is to pack in as much as possible in the day. To me, it is cruel. Children have to play. Learning takes place as much in play, perhaps even more. These in the shot were probably heading home from their regular school day to get something to eat before they would head out again for private classes until late in the night. Crazy! When do they get the time to just be kids? The iPhone shot was taken in Seoul’s Incheon Airport, an airport that was rated as airport of the year nine years running. How about that? Airports are wonderful places for photography. Some of the new airports are architectural masterpieces. Places of wonder. For me, my favourite of all buildings. Where else can you experience such excitement? Where else do you get such a cross section of the world’s people? Nowhere! Airports are magical places. Similar to yesterday’s shot, the backdrop caught my attention. The bright lights of the display I knew would make for a good photograph if I could snap someone passing by. Incheon is not unlike major airports. It is full of people – another great reason why airports are so good for photography. I didn’t have to wait long. This airport worker, who appeared a little tired and sullen, approached. I snapped. Then I apped. And here you go. Have a good Saturday. Do something silly. 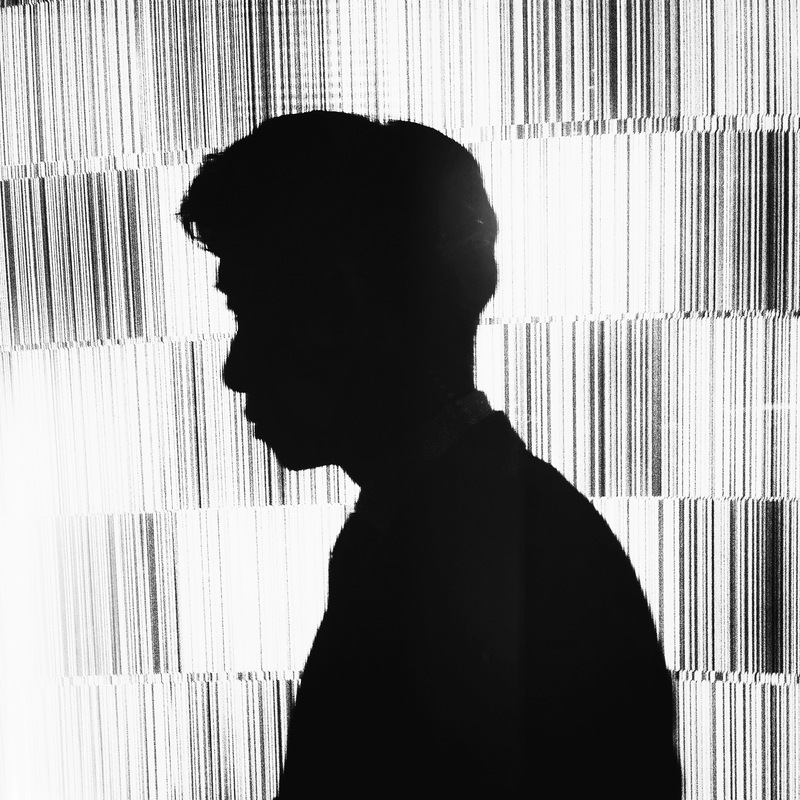 This entry was posted in Daily posts to Flickr, iPhone, Street Photography and tagged black and white photography, blur, Brendan Ó Sé, Incheon Airport, iphoneography, jazz, Korea, photography, Seoul, street photography, The man in me, With the slowest of jazz music playing.